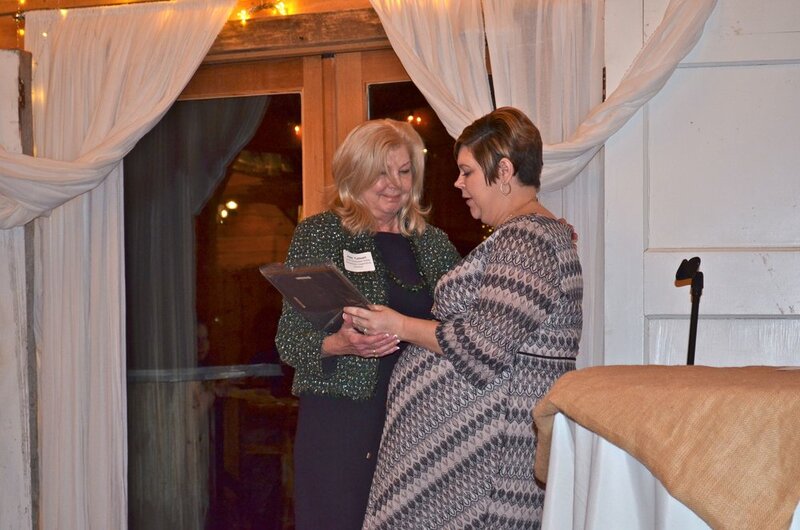 Little Tennessee Valley Educational Cooperative (LTVEC) hosted our annual Awards Banquet to honor exceptional local educators on Thursday, January 17, 2019 at at Kinfolk Farms in Lenoir City. “This event was a time to celebrate over 47 years of services from Little Tennessee Valley Educational Cooperative. More importantly, we were celebrating our outstanding educators in the East Tennessee region. The amazing work they do each day in the classrooms, the schools, and the community makes East Tennessee an outstanding place to live, to work and to grow,” said LTVEC executive director, Pam Potocik. “Anne is the Media Specialist at Lenoir City Elementary. She has also been the Site Coordinator for LTVEC’s Leaps and Bounds Extended Learning Program since it began in 2014. She is not only a day-time educator, but she devotes her time to helping students during extended school hours. She not only manages the before and after-school program, she also teaches a weekly drama club in the program. Her leadership and commitment have made the LEAPs program flourish,” said Jana Hackworth, LEAPS Grant: LTVEC Extended Learning Program Director. About LTVEC: Founded in 1971, Little Tennessee Valley Educational Cooperative (LTVEC) is a public nonprofit agency formed by local school systems in East Tennessee. The agency is governed by a board of directors including member school system directors, school board members, and county commissioners. LTVEC promotes collaboration among member school systems to develop needed educational services in the region. The cooperative provides a variety of services to member and non-member school systems in East Tennessee and throughout the state. LTVEC provides the following services: the AT Center, which provides assistive technologies (AT) that can help reduce barriers to learning for students with disabilities that affect physical, cognitive and/or communication skills; the Birth-to-Three Program, which is a nationally recognized program that provides early intervention services to infants and toddlers and education and support to their families; the Extended Learning Program, which provides before and after-school programs that focus on hands-on learning, community involvement, STEM activities, daily tutoring, and physical fitness opportunities; and, School Support Services, which provide vision services, speech, occupational, and physical therapy.